At this time I have only blank unpopulated PC boards available. I do not sell parts, kits, tubes, assembled PC boards, or complete amplifiers. I simply do not have the time or financial resources to stock, inventory, and kit all of the individual parts to offer amplifier kits. Parts packages, partial kits, and complete kits may be offered in the future. I keep a sufficient quantity of both boards on hand such that they should always be in stock. If there is a possibility of low stock, I will post that information on the home page. That has only happened once since I started selling boards. I currently have enough boards to cover all sales in 2009 (and then some) at the current sales rate. The boards that I currently stock are available for $35 USD each. I can ship 1 to 6 boards to locations in the USA for $8 in a Priority Mail envelope. I can ship 1 to 6 boards to international locations that are served by Priority Mail International for $15 USD. At this time I do not use other delivery carriers. The rates that Fedex, UPS, or DHL charge do not make sense for a single PC board. I have shipped boards to various countries around the world with very few issues. There are two countries where non delivery seems to be common, Italy and Russia. I have talked with two other suppliers of small electronics items and they concur. I must therefore not accept orders from these countries. I do not have an automated shopping cart set up on my web site. My web hosting company wants $30 per month for this service. Others want a percentage of the sale, or the cart software can be purchased for a large fee. This will be considered as I add more products, or the economy improves. My email address is located here. I can not put the email address in plain text anywhere on the web site because spammers use text searches to find your email address and fill it with junk. 1 board (either one) plus shipping is $43 USD. 2 boards (two of either kind, or one of each) plus shipping is $78 USD. 3 boards (mix and match) plus shipping is $113 USD. 4 boards (mix and match) plus shipping is $148 USD. 5 boards (mix and match) plus shipping is $183 USD. 6 boards (mix and match) plus shipping is $218 USD. 1 board (either one) plus shipping is $50 USD. 2 boards (two of either kind, or one of each) plus shipping is $85 USD. 3 boards (mix and match) plus shipping is $120 USD. 4 boards (mix and match) plus shipping is $155 USD. 5 boards (mix and match) plus shipping is $190USD. 6 boards (mix and match) plus shipping is $225 USD. I currently show amplifiers on this web site that are made with two different PC boards. I receive e-mail every day asking about my “SE amp board”. There are two different PC boards available. If you are inquiring about, or ordering a PC board, please specify which board you are referring to. I have recently received orders for “a board” or “SE boards”. I can not fill these orders. Check below to see the two different boards. Make sure you understand the differences and know which board you want. 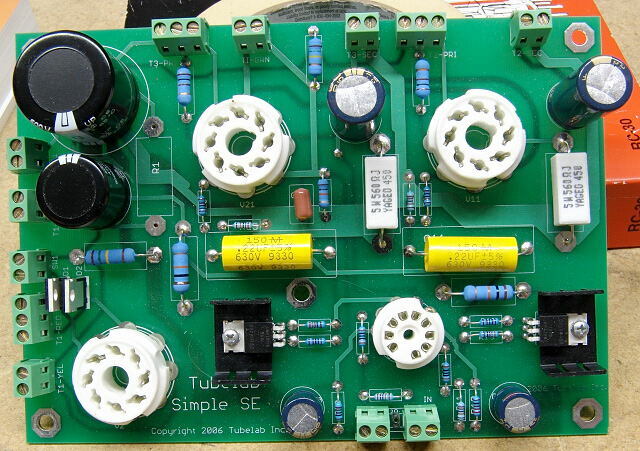 The Tubelab SE board is used for a “no compromises” amplifier that uses DHT tubes like the 45, 2A3 and 300B. It is used primarily for constructing a high end DHT amplifier. It is not uncommon for a user to spend $500 to $1000 USD for a complete amplifier, although it is possible to build an amplifier for lower cost. The Tubelab SE board was never intended to be a beginner’s level project, in fact I didn’t intend for it to be sold commercially at all when I designed the board. I have been using it to construct SE amplifiers for about 4 years. 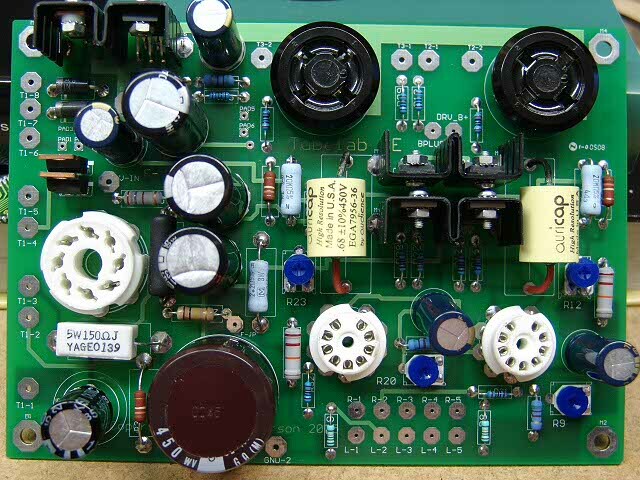 The output tubes operate in fixed bias, requiring measurements, and adjustments on a live board. External connections to the PC board are made by soldering wires to the board. The assembly manual, schematics, and theory of operation are all on the web site. The Tubelab SSE board is used to make a simplified SE amplifier that uses indirectly heated tubes like the 6L6GC, EL34, KT88 and 6550. This board is used to construct amplifiers from a basic low cost design to a high end triode mode amplifier. Most amplifiers are expected to cost between $300 and $700 USD, although you could spend less if you have some parts (transformers and tubes), and it is always possible to spend more in this hobby. The choice of output tubes are all pentodes, which can be operated in Triode mode, Ultralinear, and Pentode mode. This can be switch selectable from the amplifiers front panel. The output tubes operate in cathode bias mode, requiring no adjustments. External connections to the PC board are made through the screw terminals. The parts density is about half of the Tubelab SE. The PC board was designed to be assembled by people of all skill levels. The assembly instructions are written with this in mind. There are photographs of every step from the start to final amplifier construction. More details are being added with each web site update.